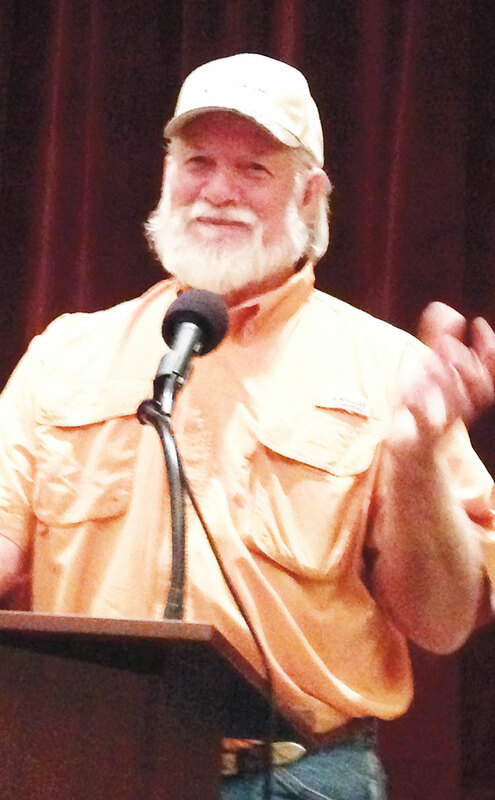 There is no better way to begin a week than with laughter on a Monday morning, and that is just what the Robson Ranch Garden Club experienced on Monday, October 19 with a program on honey bees and just good story-telling by Bill Marquis of Storey, Texas. We learned that honey bees are essential to the well-being of humans through the pollination of edible plants, but the mystery of honey bee colony collapse disorder continues, and many theories focus on pesticides sprayed on farm crops. Our honey bee is mild-mannered compared with its twin, the African bee. A few honey bee scouts will attack a perceived enemy, but the whole colony of African bees rises to the attack and it is that overwhelming number, in the thousands, that can be so harmful to animals and humans alike. The program concluded with a raffle of honey and hand-dipped beeswax candles. The membership of the Garden Club has swelled to 57, and new members are welcomed to join throughout the year. The dues are $10 per household. Our November and December meetings are limited to members only, so if you are interested please call club president, Barbara Anderson, at 940-239-6504. As autumn settles in, consider planting a new tree in your yard; that is a true gift to the future.